Our Crafty Christmas course starts on 8th November at the Hastings workshop. 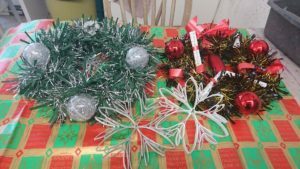 6 weeks of handmade fun including making garlands, snowflakes and lots of other seasonal stuff. We reuse and recycle lots of materials in our workshops. The workshops provide a way to learn new skills and spend time with a small supportive group of people, boosting confidence, self-esteem and wellbeing. Our workshops are free and include materials, use of our tools and so on. You simply pay £5 deposit when you book your place and this is refunded as long as you attend. Click for more info about our courses.